250 gms cauliflower florets250 gms. Roast moong dal, cut cauliflower florets and slit green chillies. Make a paste of turmeric powder, cumin powder and red chilli powder. Take sufficient water in a big size pot and stir fry dal and rice in it. When the rice is half done mix in masala paste, green chillies and vegetables, simmer (boil slowly at low temperature) till they are cooked. In the meanwhile dal and rice will also be cooked. Make a flavor by heating ghee mix in red chillies, bay leaves, garam masala and stir fry for a minute. 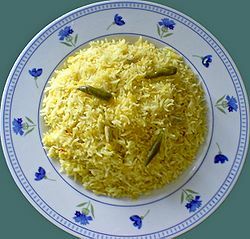 Stir in the flavor mixture into cooked khichuri. Serve hot with pure ghee on top.